Savient Pharma (SVNT) - a small cap biotech trading 50% below the 52 week high with an approved FDA drug with blockbuster potential - provides an ideal risk/reward scenario. The approved drug also has orphan status, giving it a 7 year marketing exclusivity. Naturally, the stock wouldn't still fall into the small cap arena if everybody agreed on the blockbuster potential of Kyrstexxa. The drug is one of the first for gout in over 40 years and provides treatment of chronic gout in adult patients refractory to conventional therapy. It treats an previously untreatable disease, providing for a under-served patient base. This is why many analysts and investors are high on SVNT and the blockbuster potential of the drug. Read the whole story at Seeking Alpha. In the financial world these days, information is loosely passed around as fact whether correct or not. Makes the following table interesting because a lot of people talk about copper and investing in the sector, but this has to be the first table I've seen in a while with the updated production leaders in the category based on 2010 production numbers. Freeport-McMoRan Copper (FCX) has been a big on and off investment of Stone Fox Capital. They currently rank as the top independent producer and the 2nd overall behind Chile state owned Codelco. FCX has a big lead over BHP Billiton (BHP) as well. This list further highlights the focus on FCX as a proxy for copper. Without doing a lot of research, the other public companies listed only have a small focus in copper. Number 9 Southern Copper (SCCO) is the only other option that is at least investable on US exchanges. SCCO has a $30B market cap so it isn't that small considering the big difference in production as compared to FCX. Interesting results from this poll of the day from CNBC.com. Should the U.S. Have a 'AAA' Rating? Only 464 people votes so far, but a resounding 79% voted NO. So a majority of investors feel that the US shouldn't have a AAA credit rating. Lots of economists argue that the US won't ever default no matter the debt levels because we can always print more money. Regardless a AAA rating is reflective of an countries ability to repay debt and the more borrowed the more risk that has to exist. Personally I don't understand how an investor would buy US treasuries as if we could never default. It also highlight the continued issues with the credit agencies. They are just now downgrading the US to negative watch for a potential downgrade in two years. When everybody else seems to think they are already behind. Nothing new here as the agencies are very good at telling us what we already know. It appears that Terex (TEX) has finally turned the corner. Up till now, TEX has remained one of the few companies to not turn around from the 2008 financial crisis. Sure TEX had clearly bottomed out, but after selling their mining equipment business to Bucyrus (BUCY) it left them with a construction heavy product portfolio that continued to remain weak. The Q1 earnings report finally showed a turn in the cycle as opposed to the bottoming process of the last 6-9 months. Sure the backlog had increased over the last few quarters, but this time TEX reported a 30%+ QoQ increase in all 4 segments: AWP, Construction, Cranes, and Materials Processing. AWP had a whopping 45% sequential increase and a 123% increase over last year. Cranes which accounts for over 60% of the total backlog saw a surprising turnaround with a 30% sequential increase while down on the year. As we've written on ChinaCache International (CCIH) in the past, this Chinese internet company has been completely ignored by the market. While Sina.com (SINA) has soared and numerous other IPOs have garnered attention, the market had forgotten about CCIH. Volume for two days in early April were below 50,000 shares. An absurdly low amount for a hot internet sector. Even the 3 month average volume being only 183K shares. For example, Youku.com averages nearly 2M daily shares and Qihoo 360 Technology (QIHU) averages 5.7M. The difference is very surprising considering the growth rate at CCIH. 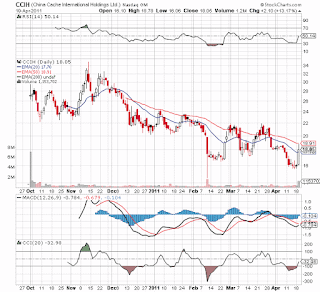 Today CCIH had 1.2M shares traded which is the highest volume on a up day since the IPO. It is also the 2nd highest day after the 1.5M shares traded on Feb 9th after the announcement of the COO resignation. Air Lease raised more then expected by selling 30.3M shares at $26.50. The $800M+ will be used to finance a growth strategy with orders for more then 150 additional airplanes on a fleet base of just 49 as of today. This values AL at closer to 1.5 times tangible book value compared to Aercap Holdings (AER) trading below 1 times book value. See my recent article at Seeking Alpha suggesting that AER becomes a much greater value especially as AL surges past the IPO price: Skip the Air Lease IPO, Aercap Holdings Provides Better Value. Disclosure: Long AER in client and personal accounts. Please review the disclaimer page. Disclosure: Long CCIH. Please review the disclaimer page. Last night, China reported inflation numbers for March that were slightly hotter then expected at 5.4% and at a 32 month high. Naturally the market tanked. 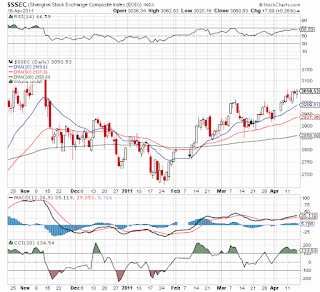 Or wait, the Shanghai Stock Market was up slightly yesterday after initially falling. On top that, the market is up at breakout levels after having recently broken above a double top at 3,000. So why didn't the market tank overnight? Partially because China has been busy fighting inflation by raising interest rates and reserve requirements for banks. Mainly though because most analysts view inflation closer to peaking. The monetary restrictions combined with a weak market in 2010 leaves China an ideal place to invest in 2011. Puda Coal (PUDA) is a coal mine consolidator and met coal washer in China that has been hit by fraud allegations from a noted short seller. At question is whether the Chairman of PUDA illegally transferred shares from a subsidiary 90% owned by PUDA to himself, then sold 49% of the shares to CITIC (China govt fund) and further pledged the other 51% for a massive loan that could threaten to bankrupt the company. With all of the recent news regarding fraud amongst China Reverse Mergers, the stock plummeted 50% within a week . Tonight on Fast Money on CNBC, Dennis Gartman had some sound advice on investing in general. Specifically though he was talking about the spread difference between Brent Crude and WTI. As he says during this clip, the spread will keep going until it stops. While that might sound a little arrogant to some, it really highlights how markets work. The oil market in 2008 kept going up until it stopped. All this nonsense on predictions just aren't that useful. An asset will keep going up until it stops. Just like tech stocks in April 2000 and housing a few years back. People kept calling them bubbles and stayed away, but in the process they missed out on huge gains. The key is to recognize when the rally ends. Buy and hold can work in non-bubble markets, but the worst thing an investor can do is ride an asset class up and then let all the gains evaporate. Great guidance from Riverbed Tech (RVBD) after the close today. The stock has been completely hammered the last couple of weeks with a whopping 6.5% drop today. Apparently this was enough to cause management to rush out the numbers for Q1. Not sure why the market continues to think that RVBD will miss estimates. This company provides a best of breed network optimization product that reduces network costs. Tomorrow should be a great day for the stock as they continue to produce record results though the stock was down 30% from recent highs. Tomorrow should be the start of a good run. RVBD will top street highs with that $.20 estimate. The 2012 top estimate is $1.44. Using that estimate that is completely achievable based on todays results, RVBD was only trading at 21.5x earnings. Note below that earnings just double for Q1 '11 and the PEG on RVBD is remarkably low. Our philosophy isn't to pick stocks based on ones potential for a buyout, but this theStreet.com report caught our attention. Harry Rady of Rady Asset Management owned biotech company Cephalon (CEPH) that recently got a buyout offer from Valient International (VRX). Since Stone Fox Capital also owned CEPH in our Opportunistic folios it was intriguing to see what else he picks, since we might have similar investment styles. Activision Blizzard (ATVI) and NuVasive (NUVA) that have been on our radar. Might be time to double up research on these picks. March was another solid month for this model, as it beat the benchmark (up 1.95% versus 0.10 loss for the S&P 500). The model also wrapped up a solid first quarter with a 6.57% gain. For a Risk Score 1 model, the goal remains to outpace the benchmark by a slight amount eac month with greatly reduced volatility as opposed to models in higher risk scores. For the month, the model sold Walt Disney (DIS) and United Parcel Service (UPS) as their net payout yields dropped below acceptable levels. Those two stocks were replaced with Gap (GPS) and Entergy (ETR). GPS maintains a modest dividend of 2%, but has made significant buybacks in the last few years. On February 24th, they announced the Board of Directors approved an additional $2 billing share repurchase authorization and a increase in the annual dividend to $.45 for 2011. For Q4 alone, they repurchased $598M of stock or an annualized rate of nearly 18% making them a top 4 net payout yield stock. Over the last 6 months, China has had four internet related IPOs that soared nearly 100% on the first trading day. The latest came last week in the form of Qihoo 360 Technology (QIHU). The stock was up an amazing 134% in its market debut, but only ranks second trailing the 161% gain of Yoku.com (YOKU). Should you buy now? Any prudent investor should take a pause after such a meteoric rise. Sure the company has a lot of potential but most companies don't live up too such grand hype. After all, there was a reason that the investment bankers priced it so much below the closing price. Do you really think they turned down extra fees intentionally? Disclosure: Long CCIH in client and personal accounts. Please review the disclaimer page. March was another volatile month. The month ended on a solid note with the Opportunistic Levered model ending with a 2.3% gain compared to a slight loss for the SP500. Considering this model ended the month with considerable leverage on the long side, its always very positive when it outperforms the market in negative months even if the loss was negligible. As mentioned in the March Investment Report, the market was in need of a selloff and the SP500 got that in the form of a roughly 7% drop to the intra-day low of 1,249 on March 16th. While many experts continue to expect and expected a larger selloff, in our view this was the buying opportunity we were waiting on. Read the full story at Seeking Alpha. Disclosure: Long MICC and NIHD for client and personal accounts. Please review the disclaimer page.